Millions of people work in India’s mining and petroleum industry. The industry is enormous and contributes significantly to India’s GDP (that is Gross Domestic Product). In mining and petroleum, people work under diverse work conditions – some work in posh offices while others have to work on sites, which are prone to injuries. 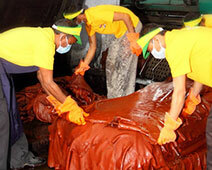 For example, a worker on a petroleum site might slip on the oily surface and injure himself – so, the workers and even professionals working on injury-prone sites keep themselves protected – with safety gear that often involve a helmet, a pair of safety footwear, and a couple of other things. For the mining and oil companies, employee or worker safety is a paramount subject – and they’ve been doing commendable work in this direction. However, there’re times when they end-up ordering safety gear for their workers and professions that are just not up to the mark. 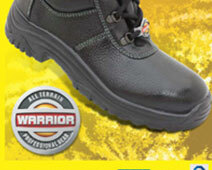 To enable these companies to get easy access to powerful, flexible, and affordable safety gear, particularly safety shoes, we, at Liberty, have developed a range that we call, ‘Warrior’. As among the first companies in Indian footwear industry, we combine our deep industry expertise with our passion to develop our range of safety shoes and work boots. These safety shoes are built with cutting-edge direct injection process with robotic technology using smart & powerful German machines to ensure uniformity of the product. Furthermore, the shoes are made with ‘Humantech Technology’ which ensures maximum comfort to feet and peace of mind – the shoes are designed to reduce fatigue and improve productivity. Plus, the shoes are wear & tear resistant, and can withstand tough terrain. All in all, you get a pair of shoes that look great, protect incredibly, and last long. At Liberty, we’re among the top safety shoes manufacturers in India, and are a customer-friendly organization with state-of-the-art infrastructure that is among the best in the world. For a reliable and quick after-sales service, we’ve our channel partners spread across different parts of the globe. Get in touch for more on our safety shoes for mining and petroleum.